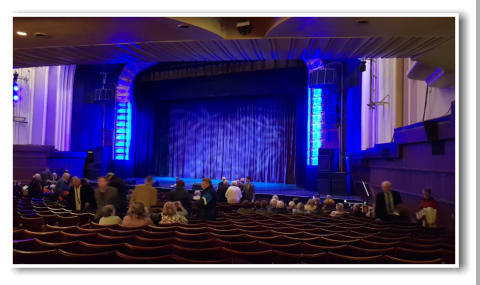 The George Formby Society have appeared in most of the rooms within the Winter Gardens in Blackpool during our stay there between 1991 and 2006 but never have they ever had the opportunity to appear in the iconic Opera House theatre which was re-opened in 1938 by our hero, George Formby. Let me say straight away, that I feel sure that George would have been proud of his devoted followers as they came on stage to sing the three most popular Formby hits, "With My Little Stick of Blackpool Rock, "When I'm Cleaning Windows" and "Leaning On A Lampost" at the Night With The Stars special show in the Opera House. The audience loved the sound of the George Formby Society and the only thing missing from this show was an encore of another Formby number! Just one year previously we had enjoyed the night of nights at the most historic event in the GFS history when some of us played for Her Majesty Queen Elizabeth II on the occasion of her 92nd birthday at the Royal Albert Hall. 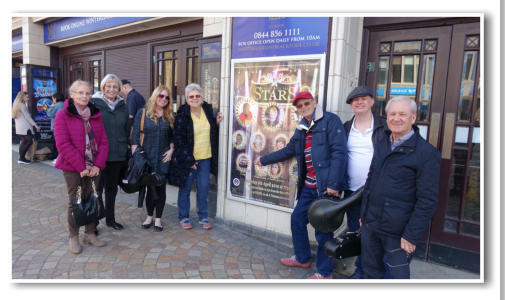 Who would have thought that we would then be invited just one year later to play in George's adopted home town, within one of the largest theatres in the British Isles? Players travelled from far and wide to make sure that they were in attendance for our rehearsal which took place in the afternoon and of course that went off without a hitch. Actually the first rehearsal was in the coffee shop opposite the theatre when in the afternoon, around twenty players gave an impromptu version of “Leaning On A Lampost” which was greeted with delight and many smiles by all the customers in the shop. In the evening we were the first act on stage after the interval and took our designated places, waiting behind the gigantic closed theatre curtains whilst out front, comedian and compere for the evening, Jim Davison spoke of his travels to entertain HM Forces in the Falklands and then, of course, he introduced the name of George Formby and spoke of George and Beryl's tireless efforts to raise moral both at home and abroad during World War II. Jim then annouced the GFS and the curtain lifted and we were off our marks with Blackpool Rock which (just like the two following numbers), was received with rapturous applause. There is no doubt that when the GFS was formed in 1961, they definitely selected the most appropriate town to hold their conventions in. 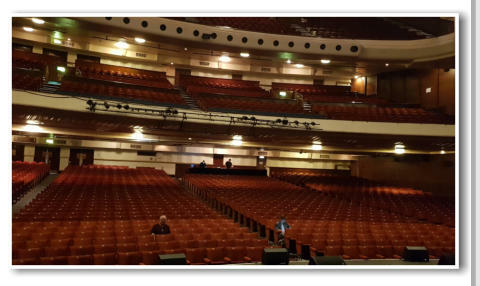 It was obvious from the warm greeting and thunderous applause and cheering that we received after each number, that George Formby still holds a special place in the hearts of Blackpool people. Gerry Mawdlsey was our link with the audience when, after each song, he stepped forward to introduce the next number and to say a few words about George Formby and our Society. Gerry mentioned the fact that we had held the very first convention in the Imperial Hotel in 1961 and then introduced the one member from that auspicious day who was also with us for this performance, then the ever-popular John Walley took a well-deserved round of applause from the appreciative audience. The backing music for the three songs was created for us by our brilliant Musical Director, Matt Richards. Matt had done new arrangements for all the three songs and his work sounded brilliant, it was a pleasure to play to such wonderful tracks. If anyone deserves a special vote of thanks for our performance, it must be Matt Richards, just where would we be without his undeniable talents? 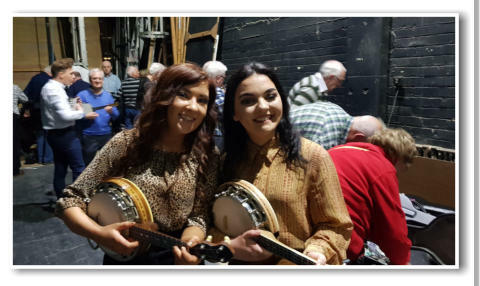 Some of our members after the show gave an impromptu performance outside the theatre within the Winter Gardens concourse and were very well received. Vivien Mawdsley, the GFS secretary should also receive everyone’s grateful thanks as without her sterling efforts, our presence in the Opera House would not have happened. Well done Vivien for all your hard work. 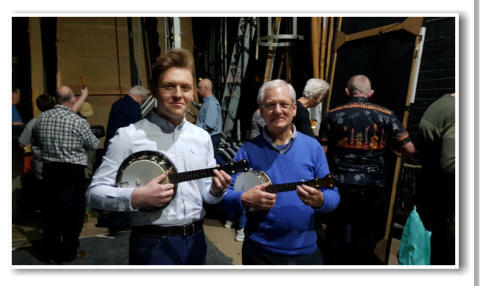 The most notable memory for me however, was the fact that our efforts both inside and outside the theatre were so well received by all and of course it goes without saying that pulling all the strings for this momentous day with those magical songs and that wonderful personality was the man himself, George Formby OBE.